5つ星のうち5.0Nova Seed for the win! Yes! Yes! Yes! It was worth it! I bought this movie on iTunes when it came out. Something I rarely do. But when a physical copy came out, I had to buy that too. 4 years, 60000 drawings. A hand animated SF classic. If you want something that reminds you of classic stories from Heavy Metal magazine then get this movie. Sadly, no extras. But, still, GET IT! This film feels nostalgic and modern at the same time. 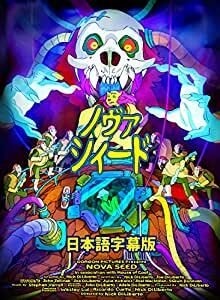 The 2D animation style combined with the characters and world designs brings the feel of the 80's but the overall fast pacing of the film brings the experience into the modern era of film-making. This is a very fun and exciting film to watch. Haven't seen a movie quite like this before. It looks like a French animation from the 80's. Loved the strange world and characters! For those of you looking for something NEW, something with a lot more GRIT than the modern animated film, you will thoroughly enjoy NOVA SEED, this film is for you.